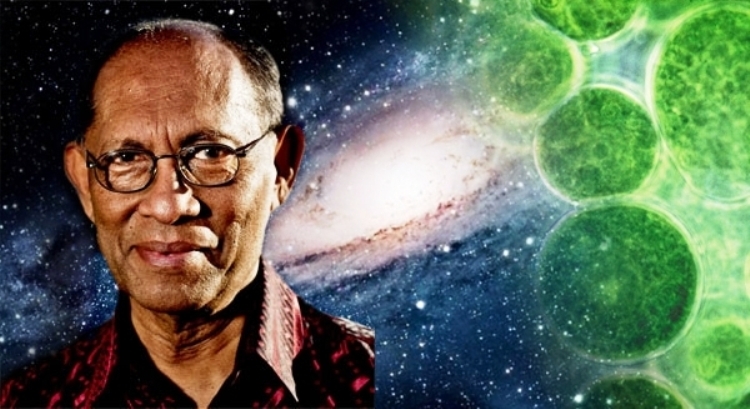 At 75, astronomer Dr Chandra Wickramasinghe is still very much the scientific maverick that he has been for several decades. He loves to challenge orthodoxy even if that means taking on much of the establishment. The Lankan-born, UK-based mathematician and physicist now prefers to call himself an astrobiologist – one studying the origin, evolution and distribution of life in the universe. He started researching cosmic dust in the early 1960s, first at the University of Cambridge and later at Cardiff University. He was mentored by Sir Fred Hoyle (1915 – 2001), an iconic theoretical astronomer who championed many an unorthodox idea himself. 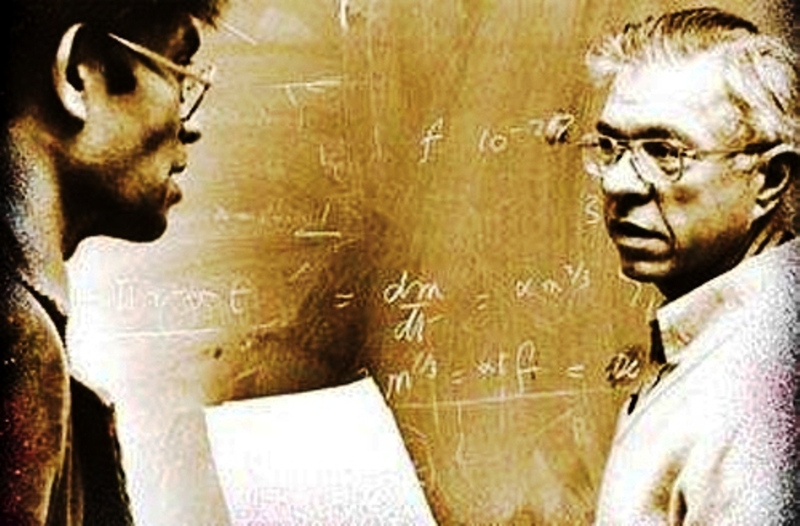 Together, Hoyle and Wickramasinghe stirred up more controversies than most scientists during the last century. 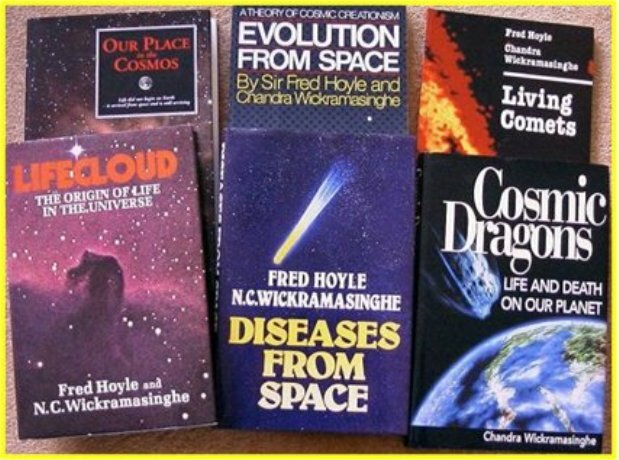 In the 1980s, they promoted a hypothesis that the first life on Earth did not originate on our planet (as widely believed by those studying the phenomenon, through a process called abiogenesis) but arrived from outer space. There, they said, life spreads via a process called panspermia – a process where microscopic life forms exist throughout the Universe, and are distributed by meteoroids, asteroids and comets. He certainly has been venturing off the beaten path, and had the courage of his convictions to articulate and defend hypotheses that often appear fantastic. Being media savvy, he has shown good sense of timing and positioning, riding various waves of public concern in a way few scientists can manage for so long. For example, in late 1986, he declared at a Colombo lecture that the HIV virus causing AIDS might have arrived from space. It created news headlines (and earned me my first front page news story), even though reputed virologists soon dismissed the idea as implausible. In 2003, he also suggested that the SARS virus might have similarly arrived from space (and not originated somewhere in China). Last week, Wickramasinghe showed he can still ‘tell a good story’ when he delivered the fourth Ray Wijewardene Memorial Lecture to a packed Colombo audience. However, he opted not to take any questions – a pity, because science advances through vigorous debate. There is evidence that simplest forms of life appeared on our planet around 3.5 billion years ago. Is it home-grown or introduced from outside – or a mix of both? We can only speculate – and it has been going on for millennia. Panspermia was first mentioned by an ancient Greek philosopher 2,500 years ago, and revived in the 19th century by several scientists. But Hoyle and Wickramasinghe took it further, and looked for observational evidence which they believed they amassed over the years. Their model says that dormant viruses and desiccated DNA/RNA (building blocks of all life) can survive unprotected in interplanetary space. Such ‘seeds of life’ get around in asteroids, comets and meteors, they say, thus being protected from cosmic rays harmful to life. Occasionally, when these minor bodies collide with planets, life is ‘seeded’ on worlds that hitherto did not harbour or originate it, they theorise. Recent research has supported elements of this model – such as the ability of some bacteria and viruses to withstand extreme conditions. Since the mid 1980s, investigations by various unmanned spacecraft have also enhanced scientists’ understanding of what comets and asteroids are made of. But is the existence of organic molecules – building blocks of life – on comets sufficient proof that they are cosmic carriers and seeders of life? So is panspermia a sound hypothesis just waiting for its final proof to be confirmed? 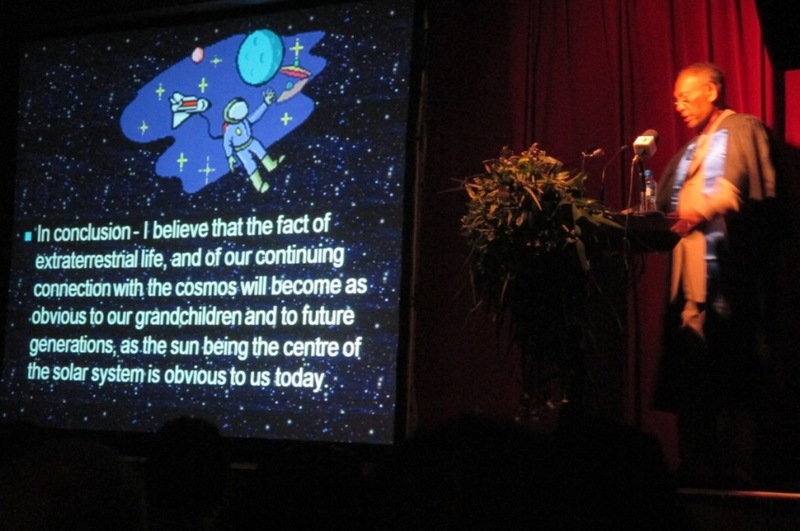 “I believe that the fact of extra-terrestrial life, and of our continuing connection with the cosmos, will become as obvious to our grandchildren and to future generations, as the sun being the centre of the solar system is obvious to us today,” Wickramasinghe said at the end of his illustrated talk. He argued that accepting life’s cosmic origins is the logical next step to removing the Earth as the centre of the universe, a process that began with Nicolaus Copernicus in 1543. Copernican ideas influenced Galileo Galilei and Johannes Kepler, but the Catholic Church and scholars of the day were not convinced. Giordano Bruno (1548 – 1600), an Italian philosopher and mathematician, went further and proposed that the Sun was just another star moving in space. He also claimed that the universe contained an infinite number of inhabited worlds, which he identified as planets orbiting other stars. Tried for heresy by the Roman Inquisition, he was burnt at the stake in 1600. Wickramasinghe mentioned Bruno, almost suggesting that similar forces of resistance are at work today against his own views. As one leading the charge for a major paradigm shift, he realizes how it challenges the status quo. 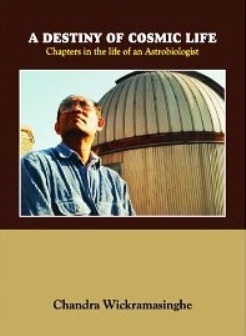 During his academic career spanning over half a century, he has had nearly 300 published scientific papers (over 70 in the high impact journal, Nature) as well as 31 books. But in recent years, he has had to publish in alternative outlets, such as the online Journal of Cosmology (http://journalofcosmology.com) where he is an executive editor. Its peer review process has been questioned in mainstream academia. Wickramasinghe contends that he is sidelined from the mainstream of scientific publishing due to his outspoken views. He claims that reluctance to accept his hypothesis is more due to cultural and political reasons than scientific ones. “The admission of extraterrestrial life might be perceived as a threat to national security. People may become so scared and emotionally so unsettled that even the enforcement of law and order might pose a problem,” he said last week. Undaunted, he carries on – and probably hopes to have the last laugh someday. In his recent autobiography (A Destiny of Cosmic Life, 2014), he quotes his friend Arthur C Clarke as outlining the four stages of how the mainstream, institutional science reacts to a new idea. First, they (the mainstream) dismiss the idea saying it is crazy – ‘just don’t waste our time’. Next, they admit the idea is possible – ‘but is of no importance’. After sometime, former sceptics start claiming that ‘we said the idea was true all along’! And finally, one of them claims: ‘We thought of it first’! Sunday Times, Sri Lanka, 27 July 2014: Beginning of life, look to space, not Earth? This entry was posted in Astronomy, Current Affairs, History, Public health, Public perceptions, Religion, Sri Lanka and tagged abiogenesis, Arthur C Clarke, asteroids, Comets, cosmic life, cosmic origins of life, Dr Chandra Wickramasinghe, Dr Kavan Ratnatunga, extraterrestrial life, Galileo Galilei, Giordano Bruno, HIV, Johannes Kepler, Journal of Cosmology, meteorites, national security, Nicolaus Copernicus, Origins of life, panspermia, Ray Wijewardene Memorial Lecture 2014, Roman Inquisition, Severe Acute Respiratory Syndrome (SARS), Sir Fred Hoyle. Bookmark the permalink. 2 Responses to When Worlds Collide #116: Did we all come from Outer Space? Reblogged this on Open Minds! (formerly: Moving Images blog).